This book contains four plays which are more likely to be read than played in the theater. 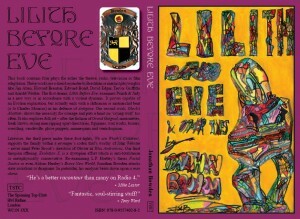 They were called Lilith Before Eve, Glock’s Abattoir, We Are Wrath’s Children!, and Evolution X. This tradition of literary theatre is quite well-known in Britain, but something else needs to be pointed out to make sense of it. This has to do with the “take over” of the theatrical space in the 1970s and ’80s—throughout the British isles—by the revolutionary Left. A whole raft of authors who were strongly influenced by Brecht and the Berlin Ensemble (in East Germany) gathered the reins of state-subsidized theatre into their hands. They were a veritable hydra whose names included Edward Bond, Arnold Wesker, Howard Brenton, Trevor Griffiths, Jim Allen, Margaret D’Arcy, John Arden, David Edgar, and Caryl Churchill (say). For example, Brenton describes himself as a “practical communist,” Allen was formally linked with the Workers’ Revolutionary Party (a tiny Marxist-Leninist sect), and Griffiths wrote the screenplay for Warren Beatty’s Reds. He never joined the Communist Party of Great Britain (CPGB), but actively fellow-traveled. In many respects, these four plays by Jonathan Bowden are a response to the above, in that they proved to be Right-wing, elitist, non-humanist, inegalitarian, and Nietzschean. A fifth dream play, Stinging Beetles, occurred in another volume, A Ballet of Wasps, which takes it outside our remit. Superficially speaking, Lilith Before Eve concerns a ventriloquist who loses control of his dummy, Glock’s Abattoir deals with a caretaker at a cemetery who cries wolf too often, We Are Wrath’s Children! involves a battle over a Will, and Evolution X is an attack on communist brainwashing. The last play of the four is the most explicitly anti-Leftist, in that it considers the reality which Francis Pollini dealt with in his novel Night, published in the early ‘’60s. This text—at once highly demotic and experimental in form—couldn’t find an American publisher. A fact which was probably due to its unheroic ethos and its depiction of G.I. degradation, or brainwashing, at the hands of Maoist interrogators. Bowden’s play Evolution X, on the other hand, deals with a quiet, isolated, Stoic and provincial hermit who is tortured into conformity by Red Guards—or possibly the secret police. He was then turned into a spy behind enemy lines, but survives in order to wreak a terrible revenge. For the spirit of Sophocles’ Theban Plays always lurks behind these particular pieces. Despite their metapolitical intent, all of these works manifest the author’s concern with various examples of Anglo-Saxon folk culture. Take, by way of illustration, the Padworth hobby-horse from the English West Country—its dark, Dominican head-gear; black coloration, spherical body, tassels, and celebration of a victory over the French, morphs in the United States. It is widely held (by many English cultural historians) to be one of the origins of the trick-or-treating, comedic, and yet slightly “threatening” sub-culture that fuels the early Ku Klux Klan. This is before the organization re-emerges as an underground army in the South, post defeat, to thwart Carpet-Bagger attempts at Reconstruction. For, in many an English ear, the American accent itself is a radicalization or extension of a Wessex or West Country diction. In any event, Jonathan Bowden looks at two major forms of English folk art, in extenso, during these plays. The first was the Mummers’ dramaturgy and the second is Punch and Judy. This playwright quite clearly adores Circus, ventriloquism, music hall, vaudeville, animal taming, Grand Guignol, contortionists, side-show barkers, mountebanks, Mystery Plays, strong men tearing apart directories, fair grounds, old-fashioned wrestling, ghost trains, escapology, and mesmerism. The Mummers’ plays were often without sound, involved blacking-up and Top Hats, as well as a ubiquitous female figure: the Bessy. They are a very ancient village tradition that often featured sacrifice—by burning like a Guy—at their summation. Punch and Judy, by contrast, has lasted in one form or another for centuries, but the modern tradition harks back two hundred years to the late 18th century. It is an Italian import which involves glove puppets who are controlled, in the booth, by a manipulator known as the Professor. Punch is a cardinal nightmare or Prince of Folly (possibly the first Tarot card) who beats his wife, throws the baby out of the window, attempts to murder his benign familiar, Clown Joey, and ends up eaten by a Crocodile. This saurian is a synonym for a Dragon who also stands for the Devil. Punch often beats the Devil and jumps up and down on him, in a reverse Gnostic or transgressive touch. Doctor Johnson commented on this extensively in the 18th century. He once snapped “the first Whig (liberal) was the Devil.” One notion which is never commented on, however, is that Punch and Judy is a purely Aryan or Gentile form. No Ashkenazic can be a Professor. The reason being that pork sausages actually have to be handled (traditionally) during the performance, hence all the tom-foolery about porkers involving Punch, Clown Joey, the Crocodile, the Doctor, and the Policeman. It is quite clear that Jonathan Bowden believes that the antidote to cultural Marxism is folkish (at least in part). This is accompanied by an insight which was borne by the violence of these Popular forms. For in modern art—power is beauty. 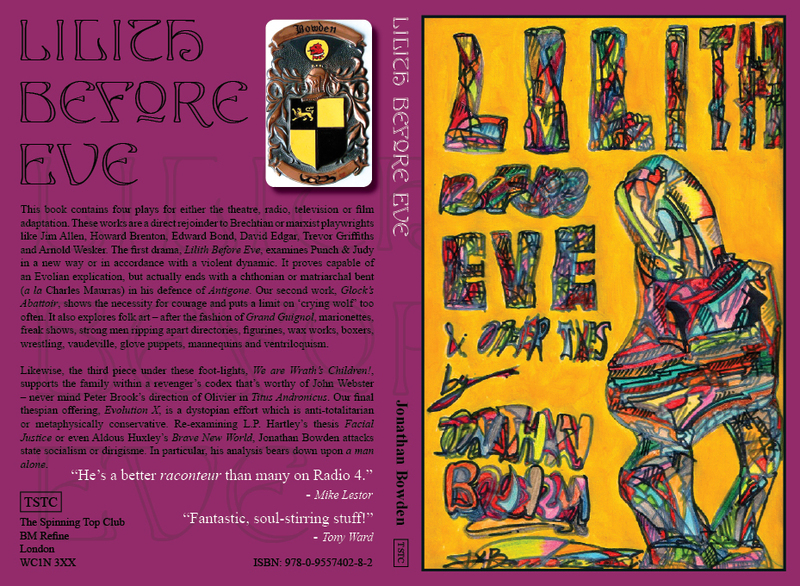 You can read or buy Lilith Before Eve here .